4.5mm Trace Rod containing 3 or 4 individual copper wires. Can be in series or parallel, or individual, suitable for camera connections. used and includes a guide head and generator connection. "Rod only" also available in per metre lengths. 350mm Diameter reel with socket for connecting transmitter & aluminium guide tip. 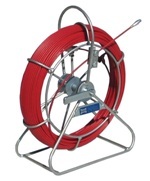 For best results use in conduit/pipe diameter up to 100mm.